Growth in New Zealand’s primary industry exports is forecast to increase substantially in 2018, but will hinge on sustainable resource use, says Agriculture Minister Damien O’Connor. The latest Situation and Outlook for Primary Industries report shows the sector’s exports will grow by 8.5 per cent in 2018, to $41.4 billion – the largest annual increase since the 2014 dairy price spike. 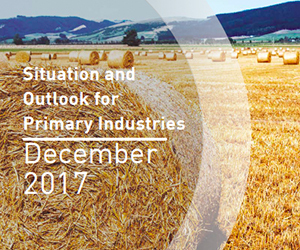 While the prospects for the primary industries look positive, New Zealand and other primary producing nations face the global challenge of sustainability, notes Minister O’Conner. “This means placing an even greater focus on high-value production, sustainable resource use, managing the risks posed to our primary sector by harmful pests and diseases, and meeting ever changing consumer demands”, he said. The forestry sector is on pace for a third consecutive year of strong export growth with exceptional demand from China. Forestry exports are forecast to reach nearly $5.7b in 2018. Horticulture exports are forecast to grow 5.2 per cent in 2018 with broad-based growth across the sector. Wine, kiwifruit, and pipfruit are all contributing to this growth story, and there is a high level of investment supporting further growth. Rising prices for wild capture fisheries products and aquaculture volumes are expected to contribute to a 4.4 per cent increase in seafood exports to $1.8b. Honey export volumes are forecast to resume growth after a dip in 2017, while exports of innovative processed foods, including dietary supplements products, are expected to resume their growth.